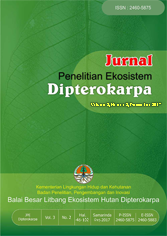 Jurnal Penelitian Ekosistem Dipterokarpa is published by Balai Besar Penelitian dan Pengembangan Ekosistem Hutan Dipterokarpa previously known as Balai Besar Penelitian Dipterokarpa. The name of the publisher has been changing since a merger between the Ministry of Forestry and the Ministry of Environment, to become the Ministry of Environment and Forestry, Republic of Indonesia (Presidential Decree No. 16/2015 and Ministerial Decree No. P.18 / Menlhk / Setjen / OTL.0 / 1/2016) . According to these laws, Dipterocarps Research Center was changed into Dipterocarp Ecosystem Research and Development Center. Publisher logo also changed to follow the Ministry of Environment and Forestry new logo. JPED was first published under the name Jurnal Penelitian Dipterokarpa (JPD) in September 2007 with ISSN number 1978-8746. Due to a merger between the Ministry of Forestry and the Ministry of Environment into the Ministry of Environment and Forestry, Republic of Indonesia, JPD was further changed into JPED in 2014 (print ISSN: 2460-5875 and electronic ISSN: 2460-5883). Innitially JPD only focused on research on Dipterocarp species. After transforming into JPED, the scope is broader, consists of various aspects of Dipterocarp forest ecosystems and the environment, including Silviculture, Environmental Services (Forest ecosystem valuation), Forest Biometrics, Forest Products Processing, Forest Engineering and Harvesting, Non-Timber Forest Products, Forest Protection, Forest Resources Conservation, Social Forestry, Forest Economics and Policy, Plant Ecology and Forest Biomass, Microbiology and Biotechnology, Forest Pests and Diseases, Wood Anatomy, Hydrology and Forest Soil Conservation, Dendrology, Phytogeography and Tree Architecture, Plant Physiology. Copyright © 2018 | Jurnal Penelitian Ekosistem Dipterokarpa. The JPED is licensed under a Creative Commons Attribution-NonCommercial-ShareAlike 4.0 International License.